Create With Me: Mid Month June CAS Mix Up Reminder! I'm here today as a mid-month reminder of the June CAS Mix Up challenge! Loll is our hostess the month and this is her challenge. Here's my card using Layered Embossing Powders, Die cuts, stamping and water coloring. Here's how I used layered embossing on my die cut seahorse. I die cut the seahorse out of mat board. 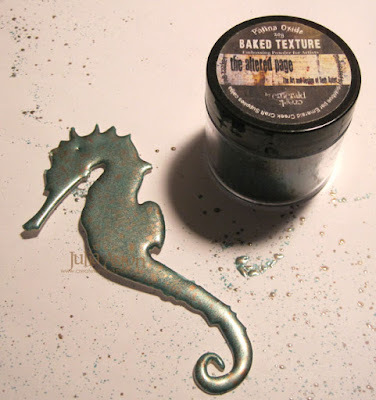 Then I rubbed Versamark ink over the seahorse and spooned Baked Texture Patina Oxide Embossing powder over it. This EP has powder and bits of gold in it. I held my heat tool about 10" above the piece going back and forth over it so it wouldn't all blow off as it heated up. Then I could move the heat tool down closer to get it all melted. Look how thick and gorgeous this looks already! Then I inked around the nose and up around the outside edge down to the tail with Versamark and spooned on Baked Texture Deep Sea Embossing Powder to add another layer and color to my seahorse. I used the same melting technique - holding my heat tool high above the piece until the powder started getting hot and then lowering it to completely melt the powder. While I was at it - I die cut 4 seahorses so I could make more cards! They all look a little bit different, depending on how much of the Deep Sea EP covered the area. I added a blue enamel dot for the eye. To create the watery background, I took a panel of watercolor paper and tapped it onto my craft mat where I had rubbed Ranger Distress Cracked Pistachio Ink spritzed with water. 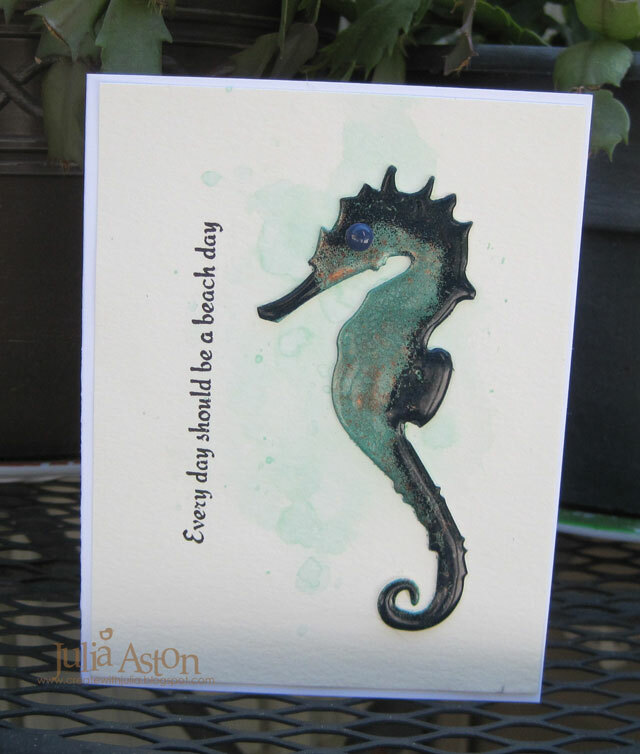 I stamped this fun Beach Day sentiment from Technique Junkies and glued the seahorse over the background. 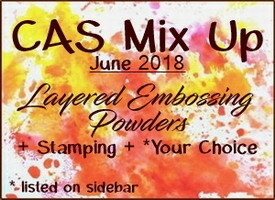 You'll find lots of inspiration from the Design Team as well as links to videos for various Layered Embossing Techniques over at CAS Mix Up! 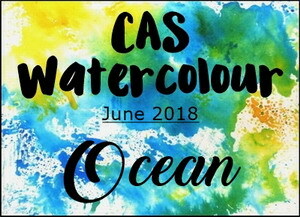 You have until 6/24 to link up your CAS project! Hope to see you there!! Ink: Hero Hues Black, Versamark, Ranger Distress Cracked Pistachio. Accessories: Patina Oxide Baked Texture Embossing Powder and Deep Sea Baked Texture Embossing Powder - Emerald Creek, Sand and Sea Die - Sizzix/Tim Holtz, navy enamel dot, Tombow Glue. Beautiful Layered Embossing seahorse, Julia. TFS all your photos. 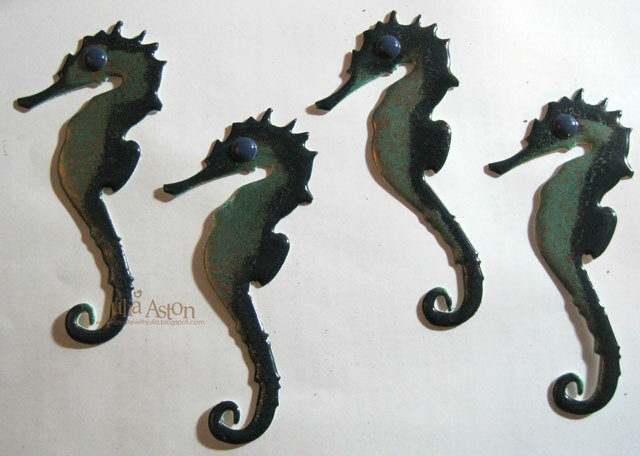 You are going to have fun in the future using your extra seahorses for mixed media projects:-) Hugs. Wow! 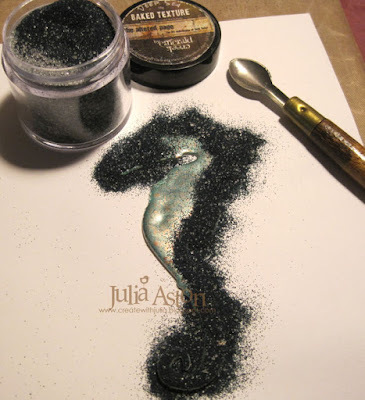 Love this seahorse, Julia! What wonderful depth and color you've achieved using this technique! The light splash of watercolor and perfect sentiment make this a wonderful card! 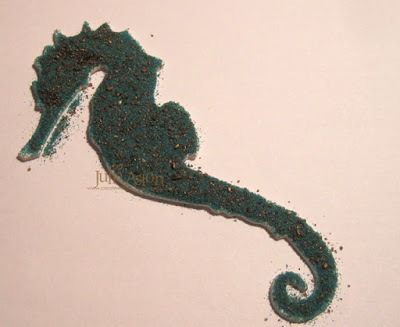 The seahorse is marvelous - wonderful colours with the careful layering and melting. Perfect against the very simple background! I love the sentiment. I love, love, love this! The seahorse looks amazing! Thanks for sharing how you did the seahorse. It looks fantastic and just shines.